The Pictorial Dictionary Mongolian is a Duden-style dictionary designed for foreign learners of Mongolian. It was the brainchild of Batsukh Baasanjav, a young teacher of Mongolian at the Mongolian National University. I got to know Batsukh in late 2007 through Dr Tserenpil, co-author of the Mongolian Grammar, and to my great good fortune, Batsukh agreed to give me private lessons in spoken Mongolian a couple of times a week during that winter. Batsukh was a demanding teacher. Unless absolutely necessary, she spoke only Mongolian and forced me, as a student, to continually push against my envelope of comfort. Unfortunately, with my brain still wired to Chinese throughout the working day, I was mostly unable to do justice to her rigorous and creative teaching. During the lessons it became clear that Batsukh was not totally well, and eventually, tired by the strain of teaching during both the day and evening, she asked to suspend our lessons. Just a few months later, I learned that Batsukh was critically ill with tubercular meningitis, with a matter of weeks to live. Batsukh was only 30 when she died. She was unmarried and had no children. 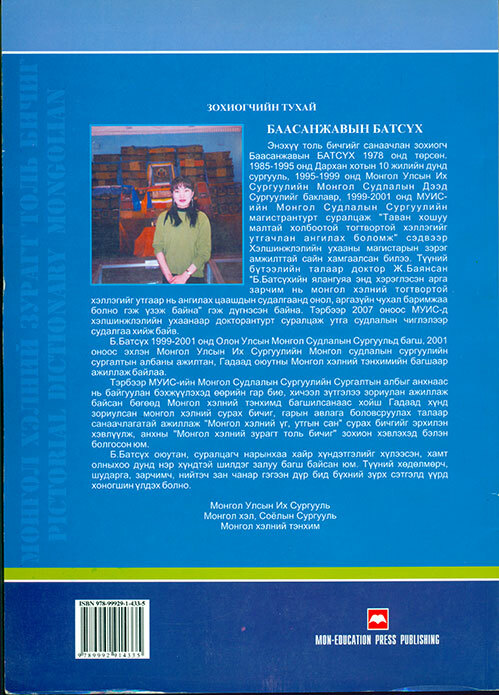 Her sole legacy to the world were the students that she taught and an unfinished project to create a pictorial dictionary for students of Mongolian. As a gesture to her family, Batsukh's colleagues decided to complete Batsukh's project and publish her dictionary. Because the publisher was not convinced that this was a commercially viable venture, all publishing and printing costs had to be paid up front. Despite the Mon-Education Press Publishing attribution on the cover, this is essentially a self-published book. The Pictorial Dictionary Mongolian puts into practice the old idea that "a picture is worth a thousand words". Samples can be seen below. 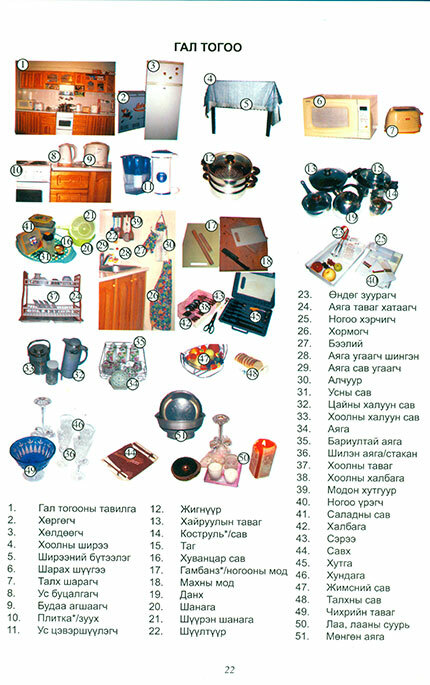 Instead of having to search through a dictionary to find out what an "electric kettle" or "hot-water jug" is called in Mongolian, the user can instantly see what he/she is looking for: an ус буцалгагч (us butsalgagch). 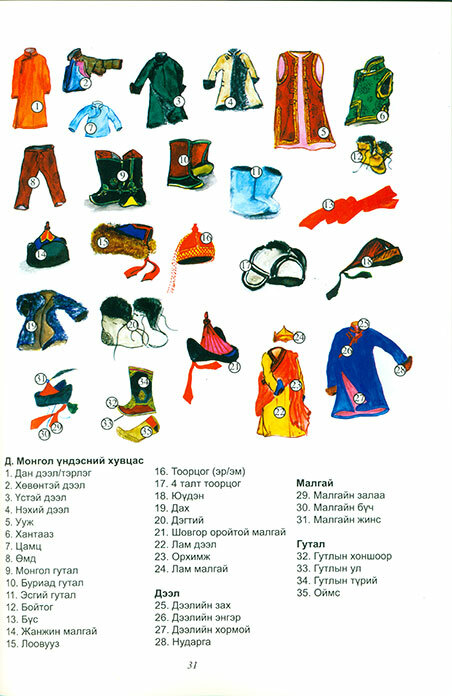 In case the identity of the object is not totally clear, there is an English glossary at the back, a useful addition despite some unnaturalness in the English used. 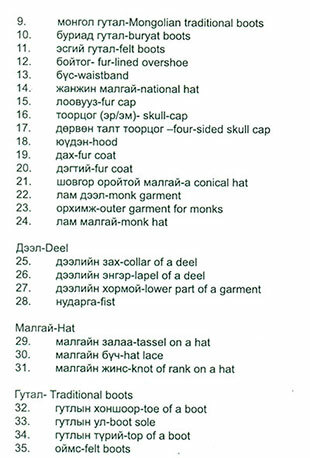 Thankfully for the learner, the English is not placed on the main page itself, meaning that the Mongolian name can be directly associated with the object itself, not with the English. The marking of Russian loan words with an asterisk is an especially useful feature. While only a slim volume of 114 pages, there is a lot in this dictionary. It is particularly useful because it is attuned to the kinds of item that are found in Mongolian life. There are even sections featuring familiar patterns in traditional design, traditional handicrafts and ornaments, livestock, wrestling, Mongolian New Year, traditional measurements, and many others. In addition to obects and body parts, it also illustrates family relationships, the time of day, and familiar actions. 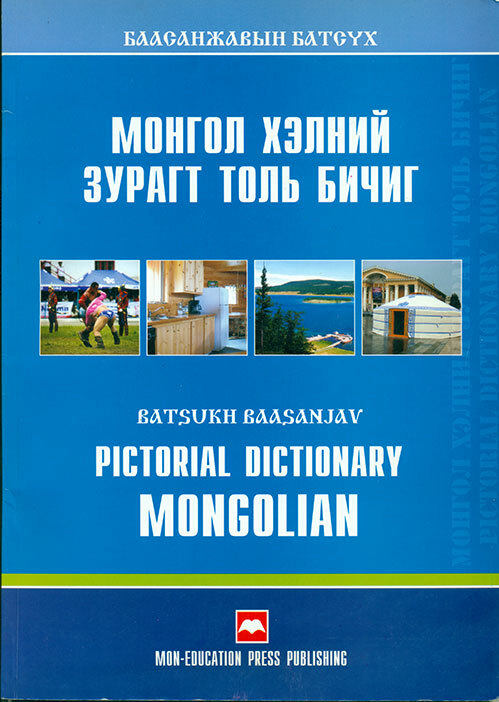 Despite its great usefulness, this dictionary is virtually unknown and unavailable outside Mongolia. If you're a student of Mongolian at the National University, you can get it quite easily. If you live in Ulaanbaatar, you should be able to find it in at least one of the main bookshops (see Bookshops in UB). But if you're not in Ulaanbaatar, you will have trouble getting hold of it at all.